"The artistic and literary scene that flourished paradoxically under censorship and repression has died off. ... The people of Central Europe traded in ideas for groceries and for not being beaten to death by the police. Michaels’s book has its faults. Her summations of how the world once work — meant to both show how much we’ve devoted to this economic story today and remind us that things can be different — are tinged with the hue that colors Ostalgie: the backward-looking amnesia that infects those Central Europeans who have decided things were so much better under communism, or, if you’re in the right country, under the Habsburgs. “Back in the 1950s, the relationship between employees and their companies involved commitment and reciprocity; workers were committed to the job in return for wages and promotions, and the company was committed to its workers in return for their hard work and loyalty.” Well, maybe. But admittance to the wider workforce was restricted at best. Such a point is like looking back on the days of incredibly low unemployment in communist Poland... without mentioning that if anyone protested for safer working conditions, the police might just shoot him in the head. Every monoculture will have its downsides, and trading one for another will always lead to unexpected deficits. But maybe if we acknowledge that the economic story looks like it’s coming to an unhappy ending of environmental degradation, widespread poverty, and hunger as resources become scarce, we can see what we might get in return. Leaving the economic monoculture, particularly now that it’s a worldwide system, is not going to be any less of a dramatic act than Havel’s Velvet Revolution. Michaels makes a strong case that this story is stripping us of our environment, our creativity, and our personal happiness. We are, for the most part, bogged down in the daily struggle for survival, too worried about losing our fragile position within a corporation to envision an entirely different way of being. It’s going to take another Havel, someone who can see the world for what it is and find a better story to tell. The problem with thatkind of books is quite obviously, that they describe rather well the status quo, but don't give sufficient answers by lack of an adequate analysis of the socio-economic impact into the cultural and academic sphere, which is causing the observed depletion. Slaughter, Sheila and Rhoades, Gary. (2004). Academic Capitalism and the New Economy: Markets, State and Higher Education. Baltimore, MD: The Johns Hopkins University Press. On August 19, 2011, Russians commemorate 20 years since the “August Putsch,” (August Coup) a failed coup d'etat conducted by a number of KGB officers and military units who were opposed to Gorbachev's reform program and decentralisation of power to the Soviet republics. 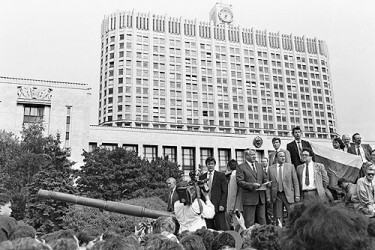 Citizens took to the streets to defend the White House, the then-residence of the Supreme Soviet of the Russian Federation, against the coup. The Russian blogosphere - divided as usual - has been discussing the 20th anniversary of the Coup, an event which has numerous contesting interpretations. Will bloggers succeed in transferring the hope for democracy and freedom felt by the defenders of the government to the younger generation? Detailed diaries of the Coup period have been shared online by oleg_kozyrev [ru], yustas [ru] (Sergey Yushenkov, whose father actively defended the White House), babushkinskaya [ru], hasid [ru], Adele Kalinichenko [ru] at ej.ru, and others. Mikhail Gorbachov, former president of the USSR, gave a detailed interview at Echo.msk.ru [ru]. Это один из самых важных моментов в моей жизни. Впервые, в тридцатипятилетнем возрасте, я понял, что живу дома, что это моя страна. Августовские события 1991 года – единственное, за что наше поколение может себя уважать. Больше, увы, пока хвастать нечем. This was one of the most important moments in my life. For the first time, when I was 35, I understood that's my home, that's my country. The August events of 1991 - they are the only thing our generation can be respectful of. So far, alas, there's nothing [else] to be proud of. 21 августа мне стало ясно, что мою страну захватили враги, в Кремле измена и надо уходить в партизаны. […] казалось, кроме нас троих измену в Кремле и вражескую оккупацию Родины никто не заметил. On August 21 [the end of the Coup and the victory of pro-democracy forces] it became clear to me, that my country was conquered by the enemies, there's a betrayal in the Kremlin, and I should go guerrilla. […] It seemed, that except the three of us, no one had noticed the betrayal in the Kremlin and the enemy occupation of our Motherland. Россия должна стать частью европейского пространства (не только в географическом, но и культурном, правовом и т.д. смыслах). […] В 1991 году эта идея была, её большинство вслух не могло сформулировать из-за многовековой атрофии голосовых связок, но внутри она жила. Что вот сейчас откроют границы, люстрируют вохру и туземных служителей колониальной фактории. Независимый суд, многопартийная система, ну и прочий базовый набор добродетелей белых людей. Russian bloggers from different political clusters of the blogosphere reflect on the August 1991 events almost every year, comparing the dramatic events with the contemporary political situation (see Global Voices reports from 2006 and 2007). The reflections and recollections change from year to year, as does the overall discourse on the event. 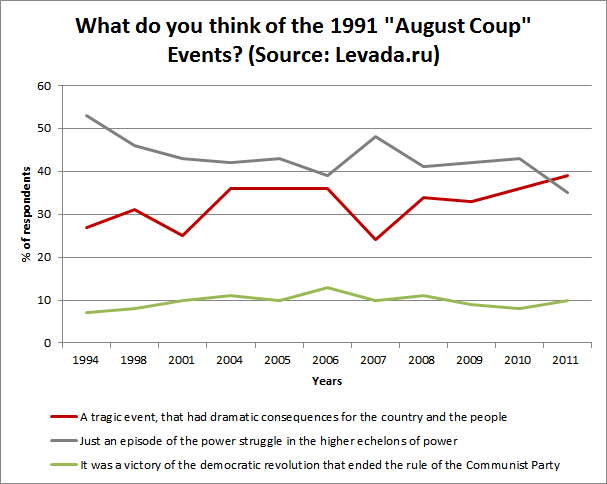 A survey [ru], conducted by the Levada Center since 1994, indicates that the perception of the Coup has significantly changed from a ‘routine power struggle episode' (the dominant interpretation in the 1990s) to a historical point ‘that had dramatic consequences for the country and its people' (see illustration below). At the same time, it is only the educated and more professional minority (7-10 percent of the population) that supports the ‘democratic' version of the event; interestingly, this percentage was not that different in the 1990s - before the Internet was widely introduced. 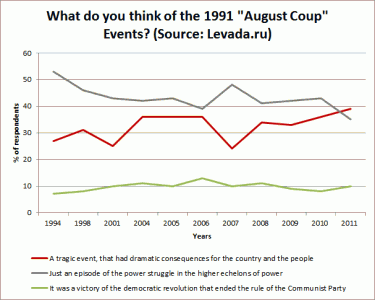 The interpretation of the August Coup is also age-dependent. While for those bloggers who personally remember the events (and some of them were among the actual defenders of the White House), the failure of the coup was something to be proud of, it is likely that younger bloggers completely miss its historical importance. Заботящиеся о стране патриоты из КГБ хотели спасти ее от развала. […] Именно поэтому в Москву ввели войска […]Но тут вмешались США. Они наняли Ельцина погубить СССР. […]Ельцин окружил Белый дом людьми, которых все три дня путча он постоянно обманывал.А потому путч как-то закончился и Ельцин захватил власть.Демократы тут же все разворовали и страна, буквально купавшаяся в роскоши до 1991 года вмиг опустела и обнищала. KGB patriots that cared about the country wanted to save it from collapse. […] This is why they brought military forces to Moscow […] But then the United States intervened. They hired Yeltsin to destroy the USSR. […] Yeltsin surrounded the White House with the people whom he constantly fooled. And this is why the coup somehow ended and Yeltsin took the power. The democrats had immediately stolen everything and the country that was leading a life of luxury [e.g. see some pics of the 1991 situation here] in a moment became empty and poor. 4. Приостановить деятельность политических партий, общественных организаций и массовых движений. 4. Stop the activity of political parties, civil society organizations, and mass movements. OpenDemocracy.net publishes excerpts from the August 1991 diary of Rodric Braithwaite, who was then the British Ambassador in the Soviet Union. Putin Watcher writes about the Putsch that dealt “the fatal blow to the Soviet Union” 20 years ago.